Prime Minister Justin Trudeau and U.S. President Donald Trump have starkly different views on the environment. 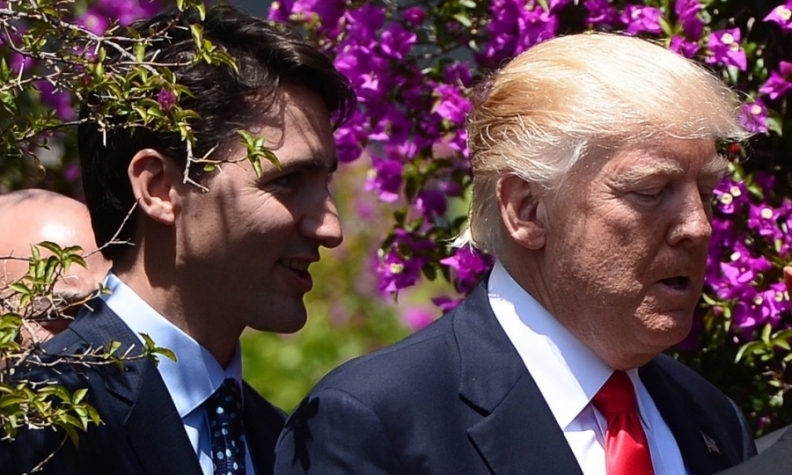 OTTAWA -- U.S. President Donald Trump's stance on climate change may end up being the biggest stumbling block in NAFTA talks when it comes to the environment. Prime Minister Justin Trudeau reiterated Friday during a tour of eastern Ontario that he wants reducing emissions, climate change and moving to a low-carbon economy to be written into the new NAFTA when Canada, the U.S. and Mexico begin renegotiating the deal later this month. "We are certainly looking for a better level playing field across North America on environmental protections," Trudeau said. However with Trump withdrawing the U.S. from the Paris climate change agreement, referring to climate change as a "hoax" and pledging to return the U.S. coal industry to its glory days, the White House and the Canadian government are pretty far apart on many environmental issues. Even getting the words "climate change" into the agreement could be a struggle. Foreign Affairs Minister Chrystia Freeland has referred to CETA as the gold standard of trade agreements when it comes to the environment and said she wants to push CETA's environment chapter with the U.S. and Mexico on NAFTA. However, several trade experts say the United States is going to be pushing for the environment chapter in NAFTA to be more closely aligned with the now-defunct Trans Pacific or TPP. "CETA is more relevant to Canada and the TPP is more relevant to the United States," said Peter Clark, an international trade expert and president of the Ottawa firm Grey, Clark, Shih and Associates. Several American states are stepping up to maintain their climate change commitments despite the federal government's pullback, although NAFTA isn't being negotiated at the state level. Meanwhile, several automakers, including General Motors and Ford Motor Co., have said they plan no changes to their sustainability plans, despite the U.S. government pulling out of the Paris climate agreement. "Major economies like California and northeastern states that already have various forms of carbon pricing may have a real interest in this," he said. Canada's coming national price on carbon adds further fuel to the debate, as some will be looking for Canadian industries affected by the carbon price to get protections, maybe even in the form of a carbon tax applied at the border on goods coming from places in the U.S. where there is no such policy. "I think Canada should immediately add the Paris accord to that list," said Clark. CETA also has what it is known as the "precautionary principle," which means a party proposing a development or an action has to prove it won't harm the environment, even if only some, not all, scientists agree it could be harmful. In CETA there is also a provision which says that the costs of pollution are borne by the polluter and requires Canada and Europe to prioritize trade in environmental goods and services related to renewable energy and co-operate on climate change adaptation and mitigation. It also makes clear that foreign companies cannot claim compensation when they believe a government's environmental regulations or policies harm their business. TPP, on the other hand, includes a provision to allow countries to suspend trade benefits with a country that doesn't respect its environmental responsibilities. Including it as its own chapter in NAFTA would make whatever environmental obligations it puts forward subject to the agreement's dispute resolution provisions. "I can't see us walking away over it," he said. "It's important, but what kind of leverage do they have?" If Canada says it will leave the table unless Trump agrees to put climate change into the agreement, he's likely to say 'fine, go ahead', said Clark. "This is not really a typical trade negotiation," he added.